Today’s iPhone, iPad, and iPod touch apps for free daily include a motorcycle stunt game, retro arcade shooter, collection of great games, and star gazing app. A number of apps drop from paid to free on a daily basis*, and we pick the top four everyday, as many of the others aren’t worth your time even for free. Everyday we try to pick apps that are worth spending money on, but are now free to download, and here they are. Bike Baron ($0.99 -> Free, Universal) [Review]: A motocross stunt game with a Trials style where you’re given a 2D course to drive through with jumps, loops, and explosives to deal with along the way. Bike Baron is from the developers of Minigore with brilliant design style reminiscent of that game. Bike Baron features fast paced action as you need to jam the gas and brake buttons respectively while switching the weight between the front and back wheel to maintain your balance. You need to have fast reactions to get through a course unscathed, but you will likely need to restart multiple times. Velocispider ($1.99 -> Free, Universal) [Review]: A retro inspired arcade shooter where you play as an arachnid dinosaur hybrid blasting away the aliens above. The game features 20 levels as you shoot down all kinds of different enemies and bosses in an attempt to protect your eggs. StarTracker ($2.99 -> Free, iPhone): A star gazing app with gyroscope support allowing you to point your iOS device at the sky to see what stars, constellations, and other space objects you’re looking at. The augmented reality app is packed with features allowing you to truly discover space right above you. Blimp ($0.99 -> Free, iPhone): In honor of the release of 33rd Division, Craneballs Studios has put their other games on sale for free. Blimp is a flying platformer where you pilot a blimp through ornate layouts, while dodging enemies, and obstacles. There are multiple worlds, and the ability to drop your own bombs on enemies. 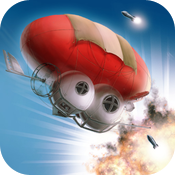 Blimp HD ($2.99 -> Free, iPad): The iPad version. Fish Heroes ($0.99 -> Free, Universal) [Review]: A 3D tower destruction game similar to Catapult King, and in a style very reminiscent of Boom Blox for the Wii. You can spin the camera 360 degrees around the 3D tower to find just the right angle to aim at, and the most glaring weakness of the shark block tower. Monorace ($1.99 -> Free, iPhone): A 2D side scrolling racing game where you ride futuristic unicycles. In each race, you simply tap the screen to switch from racing at the top or bottom of the screen to avoid all kinds of obstacles across 40 levels as well as an endless mode. SuperRope ($0.99 -> Free, Universal) [Review]: Your character endlessly climbs up the rope, and you tap to jump between ropes because the ropes only stretch for a limited distance. As you’re bouncing between rope fragments you try to collect coins while dodging monsters at the end of ropes, falling pianos, and pieces of land jutting out. SuperFall Pro ($0.99 -> Free, iPhone): An endless falling game.